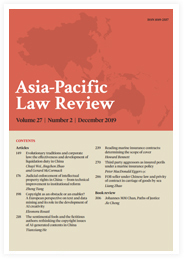 First published in 1992, the internationally refereed Asia Pacific Law Review (APLR) is the pre-eminent publication based in Asia focusing on legal issues relating to Asia and the Pacific. It provides scholarly writing of interest to both academics and practitioners in a variety of law-related disciplines. Another focus of the APLR is the development of professional legal practice in the Asia Pacific region. The journal enjoys a diverse global readership and has been recognized in many major law and social science periodical indices. 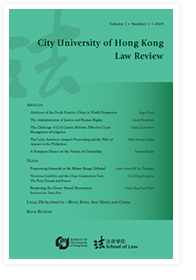 The City University of Hong Kong Law Review (CityU LR) is a student-edited, peer-reviewed academic law journal published by the School of Law of City University of Hong Kong. The CityU LR is edited by law students under the mentorship of experienced faculty members and guidance of a distinguished International Board of Advisors. The CityU LR aims to publish papers on cutting-edge issues in any area of law. It seeks to provide a platform for members of the legal fraternity in Hong Kong and overseas to engage in dialogue on contemporary legal issues of local as well as global interest. The CityU LR is published twice a year: in October and April. It features articles, notes, legal developments in Hong Kong as well as mainland China, and book reviews. The Editorial Board accepts submissions throughout the year on a rolling basis. For further information about the submission process or the CityU LR, please click here.